We are pleased to introduce a useful tool on our website highlighting the aurora borealis and the midnight sun, two natural phenomena that are integral to Fairbanks and draw visitors from around the world. The Aurora Tracker gives real-time and three-day forecasts of northern lights data correlated to six different locations. The Midnight Sun Tracker will calculate the number of daylight hours any time of year for three different locations. “This mechanism is a one-of-a-kind digital invention especially created for aurora chasers in the Fairbanks region. This real-time calculator helps to correlate the big three factors - location, weather conditions and aurora forecast - in northern lights viewing. The Aurora Tracker correlates three data streams in order to predict aurora viewing opportunities. Users can toggle between viewing locations, to see how viewing chances change for different days and time of days. Chasers are encouraged to bookmark the Aurora Tracker page and check back often as this data changes frequently. Fairbanks is a premier northern lights viewing location worldwide because of its rare position under the “Auroral Oval,” a band over the North and South Poles where aurora activity is concentrated. Because Fairbanks is on the 65th parallel, the area experiences 70 straight days of sunlight from approximately May 17 through July 27, and conversely, during the Winter Season, there is a significant reduction in daylight hours. The Midnight Sun Tracker allows users to change the calendar and/or location and realize the radical shift in light for the three areas. 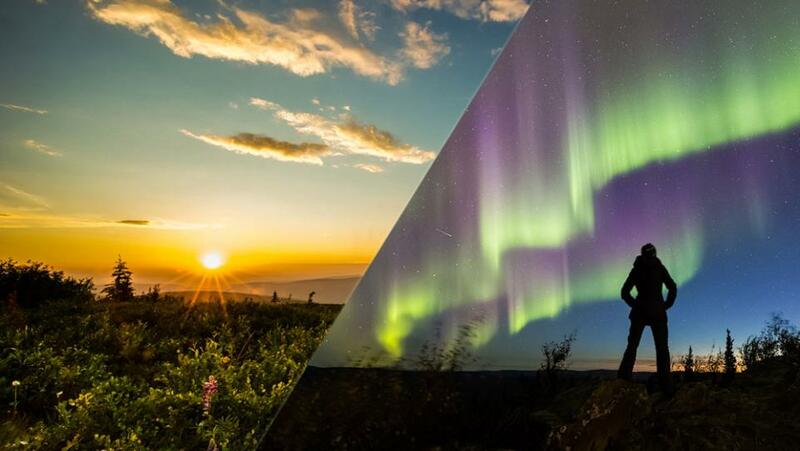 Click here to access the Aurora and Midnight Sun Tracker, which is compatible with all devices including smartphones, tablets and desktops.